Far from just being the product of our parents, University of Adelaide scientists have shown that widespread transfer of genes between species has radically changed the genomes of today's mammals, and been an important driver of evolution. In the world's largest study of so-called "jumping genes", the researchers have traced two particular jumping genes across 759 species of plants, animals and fungi. These jumping genes are actually small pieces of DNA that can copy themselves throughout a genome and are known as transposable elements. 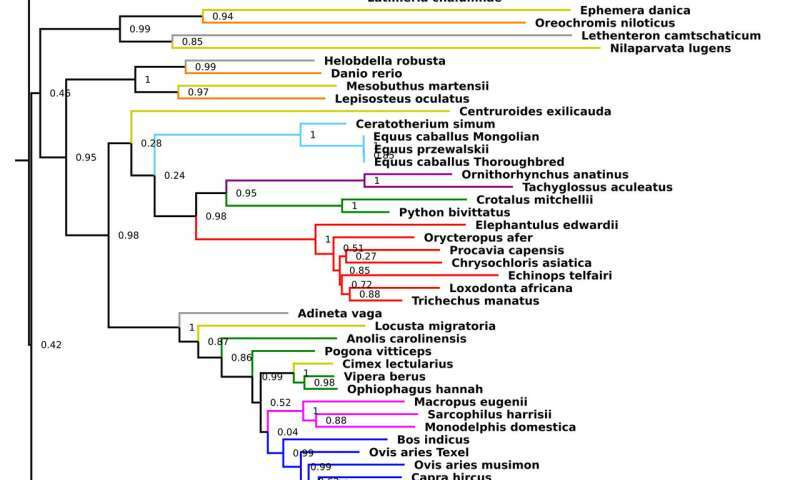 Both of the transposable elements they traced—L1 and BovB—entered mammals as foreign DNA. This is the first time anyone has shown that the L1 element, important in humans, has jumped between species. "Jumping genes, properly called retrotransposons, copy and paste themselves around genomes, and in genomes of other species. How they do this is not yet known although insects like ticks or mosquitoes or possibly viruses may be involved—it's still a big puzzle," says project leader Professor David Adelson, Director of the University of Adelaide's Bioinformatics Hub. "This process is called horizontal transfer, differing from the normal parent-offspring transfer, and it's had an enormous impact on mammalian evolution." "Think of a jumping gene as a parasite," says Professor Adelson. "What's in the DNA is not so important—it's the fact that they introduce themselves into other genomes and cause disruption of genes and how they are regulated." "L1 elements were thought to be inherited only from parent to offspring," says lead author Dr. Atma Ivancevic, postdoctoral researcher in the University of Adelaide's Medical School. "Most studies have only looked at a handful of species and found no evidence of transfer. We looked at as many species as we could." The researchers found L1s are abundant in plants and animals, although only appearing sporadically in fungi. But the most surprising result was the lack of L1s in two key mammal species—the Australian monotremes (platypus and echidna) - showing that the gene entered the mammalian evolutionary pathway after the divergence from monotremes. "We think the entry of L1s into the mammalian genome was a key driver of the rapid evolution of mammals over the past 100 million years," says Professor Adelson. "Even though our recent work involved the analysis of genomes from over 750 species, we have only begun to scratch the surface of horizontal gene transfer," says Professor Adelson. "There are many more species to investigate and other types of jumping genes." If so, Can you put an end to stupid current endeavor wasting precious resources on efforts in Rhinoceros, WHICH IS AN USELESS ANIMAL ? Didn't we already clone Dolly, The Sheep 2 Decades ago and about 50 of the Smallest Dog in the current decade ? Rather to upgrade our knowledge, why not transfer a mud nest builder bird into a bird that builds only using twigs and vice versa ? Eggs (With Zygotes) of Birds are expelled outside of Mom Bird's Body and hence there will not be any need for cruel & debilitating surgeries. Most Fish also are amenable to such tinkering ! Coming back to the original topic, for sure microbium of the intestines might have played a part. Which perhaps lends more credence to this? "Dr. Eugene McCarthy is a Ph.D. geneticist who has made a career out of studying hybridization in animals. He now curates a biological information website called Macroevolution.net where he has amassed an impressive body of evidence suggesting that human origins can be best explained by hybridization between pigs and chimpanzees. Extraordinary theories require extraordinary evidence and McCarthy does not disappoint." why not transfer a mud nest builder bird into a bird that builds only using twigs and vice versa? But would that make them more useful than a rhino? Why not rather make an ostrich that can build a house with bricks, won't that solve the housing crisis? Considering the nasty temperament of the ostrich? Would you really want to give them the capability of flinging bricks at your head? Just out of idle curiosity and not simply because of my gluttony. Would house-building ostriches be any less delicious than they are now? Would a veldt omelet be any less tasty for being the young of sophonts? Cause we, as a self-proclaimed civilization, do not seem to have any moral qualms about consuming any primate's younglings. Or let's solve the energy crisis with genetically engineered monkeys that glow in the dark! And we already started - google 'genetically modified animals that glow ...'. Cross species gene transfer totally blows Neo-Darwinist, "survival of the fittest", "evolution by mutation" out of the water. Wow.